A mum who almost bled to death after having her baby has thanked a hospital maternity team for saving her life. Natasha Middleton, 27, started bleeding heavily shortly after daughter Darcie was born at the Fatima Allam Birth Centre in Hull Women and Children’s Hospital. However, midwife Alex McCann realised Natasha had postpartum haemorrhage, the third leading cause of maternal death in the UK, and summoned an emergency team immediately to rush Natasha into the operating theatre for life-saving surgery. Today, recovering at her home in Beverley with nine-week-old Darcie, Natasha said: “I had no idea how serious it all was until afterwards and I was in recovery. Natasha has three other children – Rylie, 8, Evie, 6, and 19-month-old Noah – and her pregnancy with Darcie had been normal. She went into labour on her due date in November but stayed at home, managing her pain. “The contractions were coming ever 10 to 15 minutes at the start but this was my fourth baby and I’d had my older daughter Evie at home so I just got on with it,” she said. Contractions started coming more quickly but she took paracetamol and took the children to her mother Alison’s for Sunday dinner when the contractions were coming every two to three minutes before heading to Hull Women and Children’s Hospital. 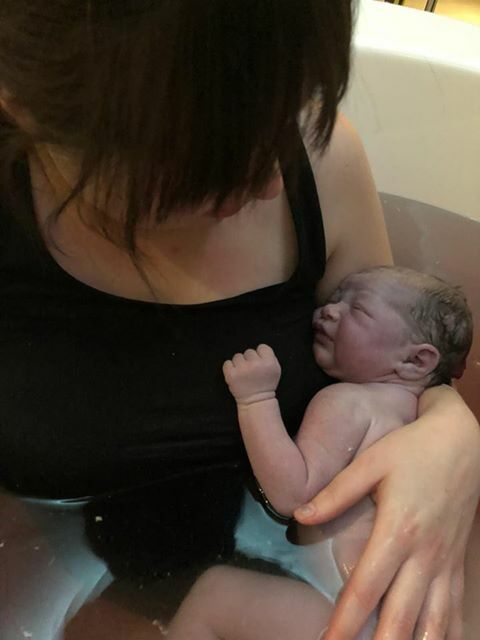 By the time she got to hospital with her mum, Natasha was already eight centimetres dilated and she gave birth to Darcie in the birthing pool just 90 minutes later. “She was born by water birth 10 minutes after I got in the pool and everything was fine when I had her,” Natasha said. 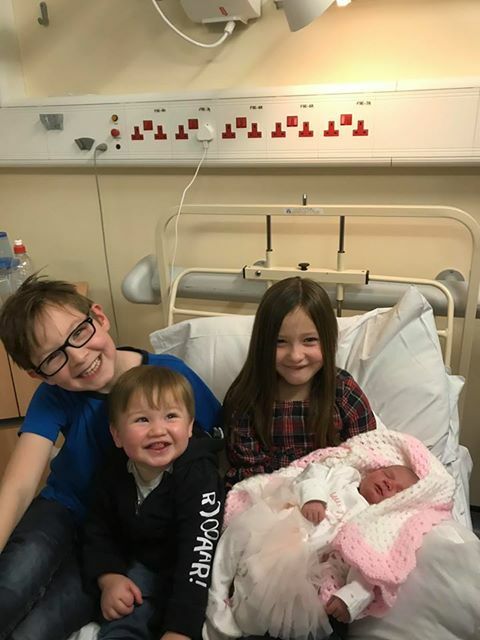 “Alex, the midwife, and midwifery assistant Jane Thompson had been absolutely amazing and they passed Darcie to my mum while I got out of the pool. Natasha didn’t realise how critically ill she was at the time and had to be persuaded to have surgery. “I was out of it and, although I was in agony, I kept saying I didn’t want to have surgery because I was frightened it would hurt and I didn’t realise a spinal injection meant I wouldn’t have felt a thing,” she said. “But they were so patient with me, even though they must have felt so frustrated. Natasha had a balloon catheter inserted to control the bleeding and had two blood transfusions after losing 2.2 litres of blood. “Alex had been with me throughout my labour and stayed with me all the time in the theatre,” said Natasha. “She only left me hours later to have a short break and to do her paperwork. “And Jane also came in to see me while I was in recovery, just to make sure I was ok.
As well as Alex and Jane, Natasha wanted to thank Dr Uma Rajesh, Consultant in Obstetrics and Gynaecology, and Anaesthetist Dr James King for saving her life. Natasha said: “Darcie was fine and remained fine despite everything that was happening to me. I was just a mess. “I just want to say how amazing everyone was in the theatre and to thank them for all they did for me. “I feel so lucky because I got to hospital when I did. I’ve been told if I’d had Darcie at home like I did with my other daughter, it could have been a different story.